The first project that I designed for my 30x30 goal is the New York City Micro Dwellings, which explored the world of living in small multi-functional spaces in a hyper dense and expensive city like NYC. As I researched the annual averages of the cost of living in NYC from about 1950 to 2016, I saw the exponential rise in the cost of living that ultimately displaced a majority of the lower and middle class population living in Manhattan. As we get to 2016, this displacement of communities and the cultures within them has already spread deep into Brooklyn, Harlem (the northern area of Manhattan), and Queens. As a proposal to help resolve this issue of displacement of communities due to the inflated price of living, the NYC Micro Dwellings combined the latest trends of the younger and middle aged generations who prefer location before living unit sizes. A majority of people living in Manhattan have accepted that the size of a living unit doesn’t matter as much as where it’s located. 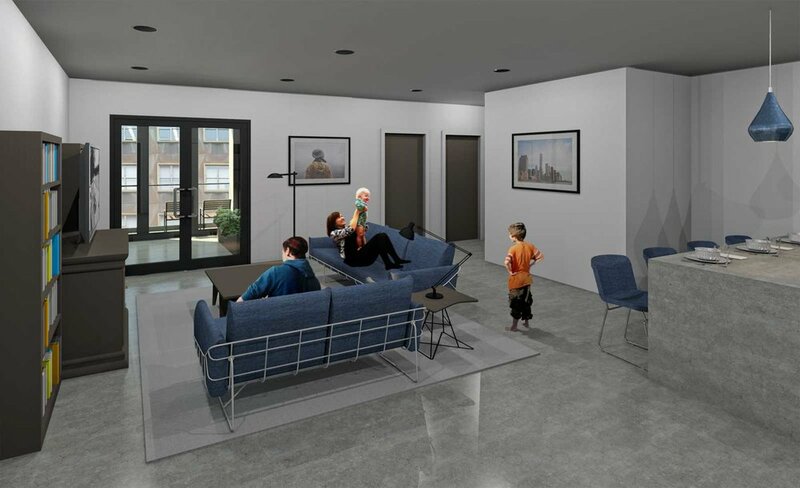 The NYC Micro Dwellings pushes this idea of living in studio apartments as an option for living in a high priced location such as the west side of lower Manhattan. Personally, I learned so much from researching the cost of living and trends through this project. I invested so much time and effort to learning as much as I could in order to develop a design proposal that responded to both the location and trends. Building off of the first project, the NYC Net Zero Public Housing was a proposal for a zero energy building that provides affordable housing to its residents through its energy efficient design. The materiality of the building is primarily cast in place concrete, which would allow the geothermal systems of the building to radiantly heat and cool the living units throughout the year. The roof of the building would have solar arrays that captures energy and shares it with all of the units. This project was an extension of the first one and my primary focus was to explore different ways that energy efficient systems can be used together with building materials to create a resilient building. Through this project, more ideas emerged that focus on the future of sustainability in architecture that I’d like to explore. Moving onto my third project, I decided to pursue this one with a fantastic group of students from a local architecture school. 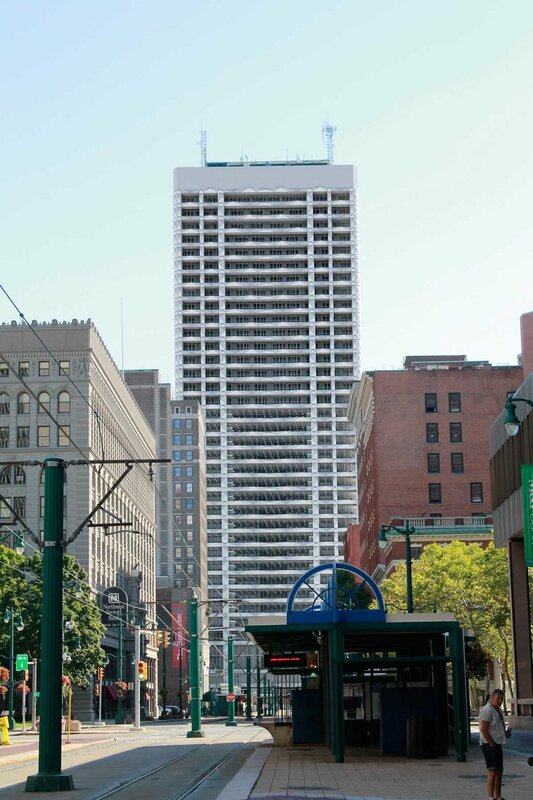 For this project, we looked at an old skyscraper (the tallest one) in Buffalo, NY that was vacant for over a decade. What was once the tallest office building was reimagined as a mix use retail, office, residential, and local architecture museum. I enjoyed working on this project with the students, who are good friends of mine and have moved onto the next chapter of their lives! Project 4x30 goes back several years where friends of mine and I got together to pursue a small architecture competition located in Japan. We were fascinated by the idea of wireless technology and the natural environment both cohabitating within a building. For this competition, we designed a building that brought the natural environment into a high rise structure and provided areas for the visitors to get together and play video games and relax in a natural setting. Project 5x30 is a real project with a good friend of mine who purchased a long abandoned building in Buffalo, NY and wanted to renovate it into a restaurant and apartment. So far, we’ve come up with a design that he really loves and he’s now growing his finances to bring it to fruition. Although I was looking forward to signing off on my friend’s documents and watching his building come back to life, I’ve decided that it will be best if I refer him to a good friend of mine to finish his documents with my oversight. Project 6x30 is a competition proposal that I pursued with another group of students who were eager to learn Revit and work on a design project. AlgaEnergy proposes the renovation of an old abandoned paper factory in Italy into an algae refinery and co-working offices. 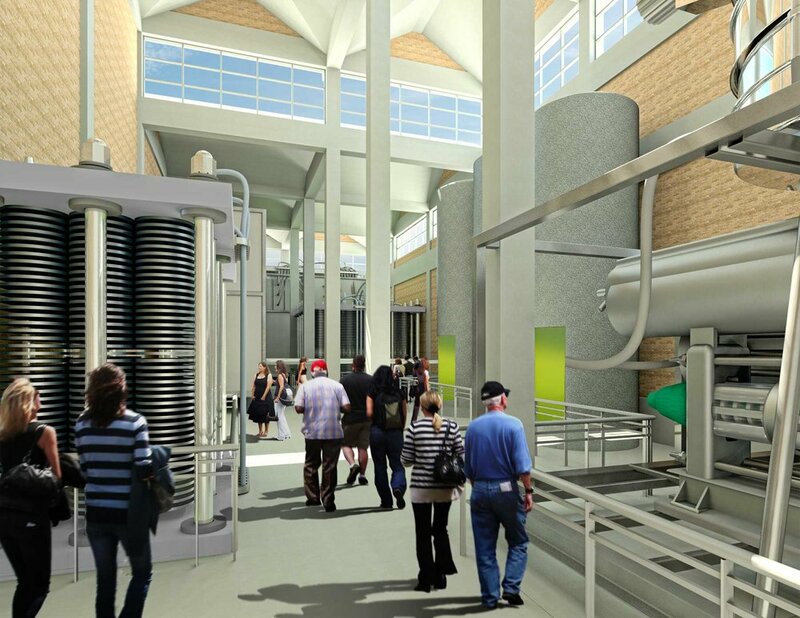 The refinery would grow algae in greenhouses on the roof of the building, transport it to the refinery on the ground floor of the building through pipes embedded in the new concrete walls, and be refined into jet fuel and by products used in industries such as makeup and others. As a group, we learned so much from this project about algae and the entire process of taking it from its natural state and turning it into essential products for our world. During the design stage of this project, I felt as if we were becoming entrepreneurs with a strong idea for a company and business model. Project 7x30 was a finalist in the Amsterdam Light Festival competition where a good friend of mine and I were proposing to build an art installation using readily available materials such as fishing line and pallet racks to create an array of light. The fishing line would be pulled in tension in a tightly spaced grid formation to form a hyper dense area of transparent thread. When struck by light, the reflections and refractions of light would spread through the entire construction, forming a field of light. Although we weren’t selected as one of the handful of winners, we were excited to have been narrowed down from thousands of entries into 100 finalists. There was some constructability issues that we ran into, which ultimately drove our budget beyond what we expected. However, with more time, I’m sure we could’ve figured out alternatives to make the project work! Project 8x30 is a project that I designed several years ago with two of my good friends for a competition in Toronto. We proposed a temporary structure called a “Sukkah” that would be composed of round paper tubes, threaded eye-bolts, and colored yarn to create a semi shaded structure that could be assembled and disassembled rather quickly. The colors of the yarn would correspond to the time of day and change with the angle of the light. Project 9x30 is another competition entry that I pursued with my friends from the OHR Sukkah proposal where we were asked to design a structure that expresses the 4 elements of Hip Hop; graffiti, DJ, breakdancing, and emceeing. We proposed an open air concrete structure where all of the walls would be open for graffiti artists to create their works of art over one another and build layers like patina on copper over time. Some walls would be operable where they can rotate and/or slide to create different spaces for the activity and number of people. We were excited to have taken third place in this competition and we loved the design and graphics that came out of this project! 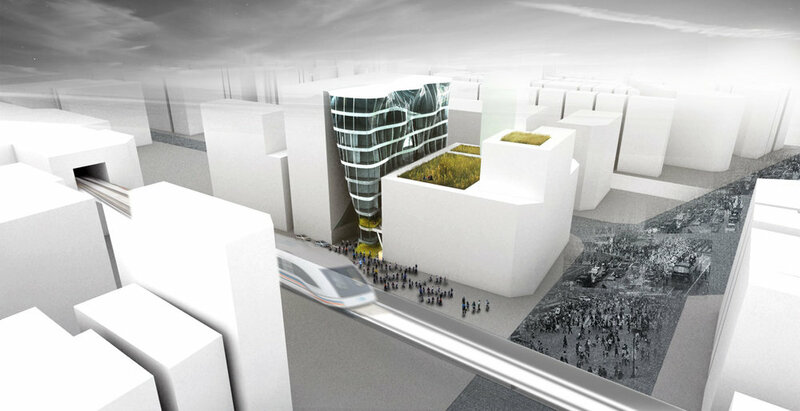 Project 10x30 is a competition entry where participants were asked to reimaging an architecture library in the year 2050. For this project, I proposed that the entire building be constructed out of wood and the primary structural frame would be assisted by the book shelves that span from the ground floor up through the entire building. The books would not be accessible by people, but would be on display. On demand, drones would fly through the space and gather the requested books. Visitors can use the touch screen tables to conduct their research and focus while the drones retrieve physical materials. My primary focus for this project was to design a wood building that incorporates the function of the program into its design. I also enjoyed making all of the graphics for this futuristic project and coming up with ideas for things that are now becoming readily available such as drones with more capabilities than film and ubiquitous computing. A project that I never considered as part of my 30x30 is my own home that I’ve been personally renovating over time. After renovating over 60% of the house, I decided that it should be added to my list of projects because it required a significant amount of thought and physical labor, which taught me a lot about architecture and construction. Project 12x30 focused on designing very small studio apartments within a skyscraper in Hong Kong for the homeless population. From my research on the housing situation in the hyper dense city of Hong Kong, I learned that there are lots of homeless communities squatting on the rooftops of tall buildings all over the city. They’ve even carried building materials all the way up to the roof and built shacks for themselves. These communities shared amenities such as outdoor gathering spaces, food, supplies, and other items. The design of the Micro Housing provided a small hotel-room design for the living units where a multi-functional space and personal bathroom is provided, but the kitchen and shared amenities are on the communal floors. I learned so much more about the housing crisis in hyper dense cities from researching the lives of the homeless in Hong Kong. It provided a good insight into the lives of the less fortunate population who don’t have shelter and search for ways to stay alive. For project 13x30, I conceived of the project while walking with my girlfriend through a beautiful cemetery in Buffalo, NY that’s very well maintained and picturesque. Being born and raised in NYC, I quickly thought about the fact that there are very few tiny cemeteries in the city. This quickly led to the design idea of the Sky Mausoleum which proposes a skyscraper that would house the remains of loved ones just like mausoleums. Every floor would contain rooms that could be purchased by a family as a condominium or coop would in residential terms and used to hold the remains of their loved ones. This project was a fun one to design and it proposes a new typology within hyper dense cities where storing the remains of loved ones is typically outside of the city or within ones homes. It also brings an interesting potential business model of people wanting to purchase multiple rooms to combine them, higher floors for prominence, and others that weren’t considered at the beginning of the project. After designing multiple affordable housing projects, I decided it was time to try designing a luxury condominium building in NYC. Project 14x30 proposes a luxury condominium skyscraper at the northeastern corner of Central Park that would provide large living units with views of the park. The units would provide large interior spaces and balconies. 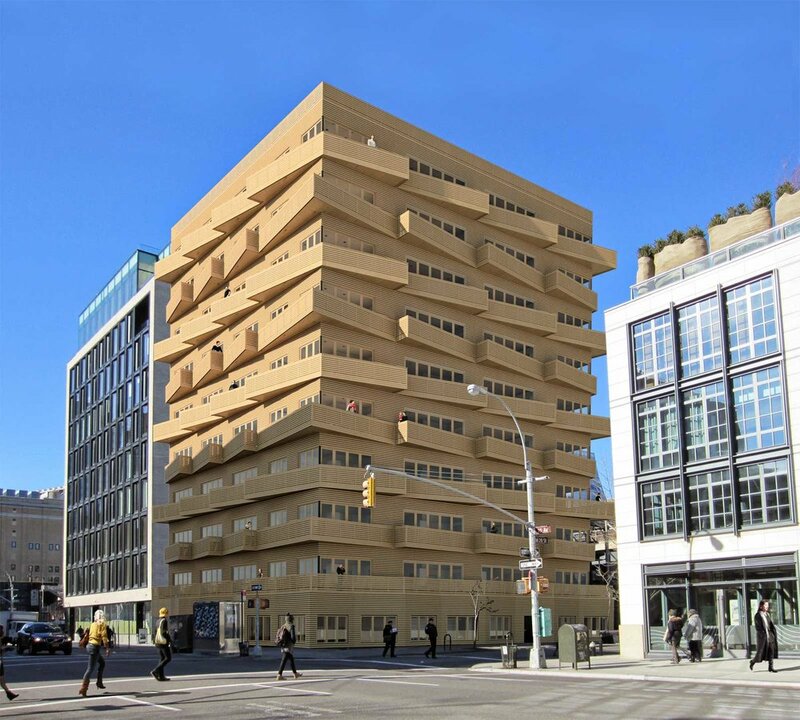 Structurally, the building would be timber framed with energy efficient systems to set a standard for the community that has yet to grow vertically as the rest of Manhattan. Although there are several more to add to this list, projects 15x30, 16x30, 20x30, and 21x30 are all leather products that I designed and handmade from high quality leather. I found my passion for leatherworking towards the end of 2017 and I’ve been fascinated by this craft ever since. Project 15x30 is a leather tote bag that I designed and made as my first project. As I learned more about the craft, I designed project 16x30, which is a more refined version of the previous tote bag. Project 20x30 is a collection of 100 minimal leather wallets that I designed and handmade to practice my craftsmanship. Finally, project 21x30 is a leather passport case that was designed to be a simple everyday carry for international travelers who keep their passport and important documents/cards on them at all times. While juggling my newfound leatherworking hobby with designing architecture, I decided to design a luxury residence in Buffalo, NY that would be located in an increasingly popular neighborhood near the river. The idea for this residence was to submerge half of it below grade with an outdoor courtyard and basement level that has direct access. The perimeter walls would be tall and create a visually and acoustically private residence. The interior of the house would be spacious and the primary material would be concrete. Once the previous project was complete, I immediately jumped into writing my first book, Starting an Architecture Firm, that I wanted to write for over a year. I decided to stop putting it off and added it to my list of projects as 18x30. This book took over a month to compile all of my notes, ideas, and resources as well as a month to edit, format, and publish. Starting an Architecture Firm focuses on the four primary areas of starting a practice; setting up the business, understanding contracts, marketing, and advice from an architect who found success with his new firm. An ongoing project that I’m excited to have started with my good friend, Mike LaValley of Evolving Architect, is a podcast called Unpacking Design. This podcast focuses on ideas, products, news, and other topics that relate to design. At first, I was afraid to speak into a microphone and I was so nervous about sharing my ideas about design with the world. However, as we recorded a few episodes, I gradually warmed up to the idea and now it’s become a fun hobby! When I started writing this post, I didn’t anticipate it resulting in such a long post. As I reflected on each project, I found that my ideas for my architectural projects all start with research on the ideas that eventually lead the design. I also found that my passion for design goes deeper than just architecture and that I’m really enjoying the world of product design through my leatherworking hobby. At first, this 30x30 goal seemed as if it was going to be impossible to complete by May 2020, but I’m well on my way to finishing ahead of that deadline! Thank you for reading and supporting me on this journey.